Barenbrug Agriseeds - Superior Pastures // News > Committed to Innovation. Committed to Farming. Home News Committed to Innovation. Committed to Farming. Because even though it’s not clear exactly what the farm systems of 2030 will look like, we do know pasture-based agriculture has a bright, positive future. And it’s our job to make sure you have the pastures and forages you need to farm sustainably and profitably in the years ahead. Read on to find out more about our latest research, and for innovative pasture mixes you can sow to improve your farm business in 2019. Our track record includes Trojan, Shogun, Rohan SPR, and NEA endophytes. All were breakthrough products when released, and each remains in a class of its own today. Trojan with NEA2 endophyte, now covering a quarter of a million ha nationwide. Trojan provides high yield, seasonal growth, persistence, resistance to black beetle, and great animal health. It offers a standard of performance few others can match. Trojan remains in the top rating of diploid ryegrass cultivars in the DairyNZ Forage Value Index (FVI) across the country. 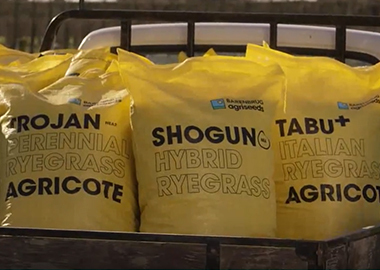 Shogun, the world-record-holding hybrid that’s revolutionising farming systems. It grows in winter like an Italian ryegrass, then in summer grows like a perennial. And it’s a world record holder. No wonder Shogun tetraploid hybrid ryegrass with NEA endophyte has literally changed the game for dairy and red meat farmers alike. It’s still in a class of its own. Rohan, the spreading perennial, purpose bred for hill country sheep and beef farms. On tougher country, you need a tougher pasture. That’s why we created Rohan with NEA2 endophyte, NZ’s only spreading perennial ryegrass, bred for persistence. It’s extending its long stolons nationwide, not only on red meat farms but also dairy farms which need dense, palatable, easy care pasture. We believe NEA endophytes provide the best balance of animal health and insect control you can buy. 30 years ago, we set out to find the ultimate endophyte, and the result is NEA endophytes. Suited to all areas of New Zealand, and unlike some other endophytes, NEA endophytes look after your stock. This makes them the obvious choice for farmers who value animal welfare. Our role is to carry on making the most efficient, sustainable pastures that we can. The more we can make pastures do, the more choices farmers will have. Our most recent cultivars reflect the new and emerging systems farmers are using to adapt to changing social, climatic and environmental expectations. Legumes will be particularly important in these systems. Captain CSP (cool season plantain) has been bred for when feed is most needed, and most N is lost. Captain CSP has been bred for high cool season growth, providing more kg DM/ha when feed is needed most, and utilising soil N in winter, the highest risk time for N leaching. Deep rooting with good yield and ME through summer, Captain suits both red meat and dairy farms. Kotuku is a very high yielding large leaved clover, with superior summer growth. Kotuku is a high performance, large leaved white clover for dairy, beef and finishing systems. It is very high yielding, with superior summer growth and good persistence. White clover is critical for nutritive value and N fixation in pastures, and is an important source of protein and ME, particularly in summer. A key to breeding Morrow was finding a great old pasture with long-lasting red clover plants. Morrow multi-stemmed red clover comes from a family of North Island plants that stood out after surviving repeated dry summers and intensive grazing. We selected the best of these for yield, persistence and flowering to create a game-changing, multi-stemmed red clover for improved production and grazing tolerance. Winter active clovers provide new pasture mix options for great cool season animal performance. Zulu II, Vista and Laser annual clovers are winter-active, to complement summer-active legumes in our pastures of the future. They have exceptional nutritive value, and are well adapted to summer dry regions. These cultivars suit both winter feed, and specialist finishing mixes, and have an ideal fit with the emerging shift towards more winter-based systems. What will the New Zealand farm systems of 2030 look like? That’s what our scientists and breeders have been asking as they develop pastures and forages that will be the engine room of those future systems. Our latest research includes deep-rooted experimental hybrid clovers bred for dry conditions and low P requirements; and the first perennial ryegrasses created with F1 hybrid breeding techniques similar to those which first catapulted maize yields skywards in the 1950s. We’re also testing recent advances in sensor technology and DNA-based plant selection, to make plant breeding and development more efficient. Instead of 12 years, for example, which is how long it currently takes to breed, test and commercialise a new perennial ryegrass, soon it might only take 6-8 years. What could your future pastures look like on your farm? Use our interactive pasture mix tool to select the right pasture and forage mix for your farming situation.